Compare at $62715 - Our Price is just $60888! Simply put, the 2017 Corvette is designed for savvy drivers who demand more from their sports cars. 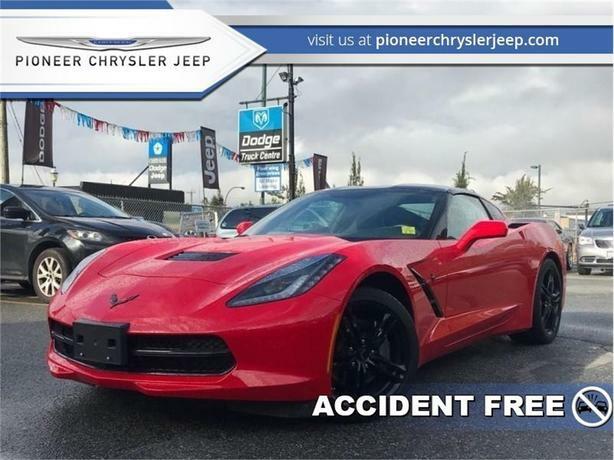 This 2017 Chevrolet Corvette is for sale today in Mission. The 2017 Corvette combines race-proven technology with a purposeful design. Every element serves a purpose on this amazing sports car, from functional exterior vents to its intelligent driver controls. A functional hood air extractor features precisely angled blades for optimal cooling airflow. The result is, it reduces lift and increases downforce, improving overall high-speed handling. This Corvette's cockpit features a flowing design made from premium materials that allows you to immerse yourself in the car during every drive. This low mileage coupe has just 12603 kms. It's torch red in colour and is completely accident free based on the CARFAX Report. It has a 9 speed auto transmission and is powered by a 455HP 6.2L 8 Cylinder Engine. / Total cost of borrowing $12811 ). See dealer for details.